If you are like most people, you know what to do when it comes to exercise and nutrition, but you may also find it difficult to do what you know! At TFW we understand this and this is why you get a motivating coach during every TFW session to help you take action. The following is an article from our Founder, Martin Rooney and covers the challenges you may face and how to solve them. When people are faced with too many options, they usually choose to do nothing at all. If you have to be Einstein to figure out today’s Russian-inspired plyometric workout or a nutritionist to understand your meal plan has to be grass-fed, organic and or raw, it will probably be easier skip the gym, hit the couch and keep eating Cheetos. If you have ever found it hard to decide on a movie or article of clothing and just walked out of the store after taking no action, you know what I am talking about. In any of these cases, again you should have learned the lesson that too many choices are not always a good thing. Many times, too many choices ultimately get you nowhere. Why then do we have to make things seem so hard in fitness and nutrition? Maybe you like the attraction of new and exotic training ideas and food, but know that same exoticness also often paralyzes you from doing anything. And if you don’t do anything, you can’t get results. So next time you want to try to add the gogi berry or some other new fruit they found in a country you never heard of, think again. Over the years, I have realized you don’t need to give a person a rocket ship when all they needed was a rowboat. Training can still have some “sizzle” without having to be confusing. You just have to get excited again about the basics. Last week I visited a few TFW gyms in the Chicago area. I met people that had lost hundreds of pounds and others that were now off medication for the first time in years. But for each person I met, I knew there were others out there choosing to do nothing due to either fear or confusion. 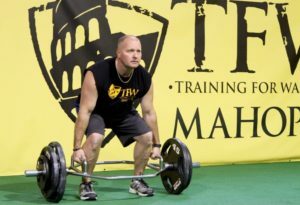 Meeting the people training at the TFW facilities only strengthened the message: You Have To Start Somewhere! And at TFW, we make it pretty easy for you. You just have to start with two simple things: DEADLIFTS and BROCCOLI. At TFW we teach people to get “started with the simple.” Warriors in our program are brought back to the basics. And two basics I know work are deadlifts and broccoli! It is a functional movement that most people can easily perform. You will have to pick stuff up during your day, so why not get better at it? Deadlifts work a high percentage of your muscles from the bottoms of your feet to the tips of your fingers. And people love watching his or her numbers increase. And few photos get more internet “likes” than when you are standing with a bunch of weight in your hands. Oh, the deadlift isn’t fun? Well maybe you don’t know as much about the “green warrior” as you should! Broccoli, which has been called “one of the world’s healthiest foods,” is a great source of Vitamins C and K which can help healing, collagen formation and protect you from free radicals. Broccoli has also been cited for anti-inflammatory and detoxification properties as well as a great food in the battle against cancer. And above all, when people eat it, they know they are doing something good for themselves. How do I know we are getting the broccoli message out there? When people dress up as broccoli at TFW events, you know people are taking the idea seriously. Are both of those the be all and end all for training? No, but they get you started which can lead to even more good habits. Give someone 1,000 choices and they will do nothing. Give them 2 and they can get started. How can you get started with Deadlifts and Broccoli? Simple: Add more weight on your bar, add more broccoli on your plate. If you do both, you will not only be stronger and healthier, but you have also done the most important thing: you will have started. Want to get started with an exercise routine? My advice is to stop looking for the new and shiny idea and find something you believe in. As I have always said, “stand for something or fall for anything.” Two things I know for sure. As a result of the 260 TFW affiliates around the world, more people deadlift and more people eat broccoli. And it is making a difference. What are your two positive things? What are two things you believe in? Once you discover them, I challenge you to make the world a better place by getting people to do them.